Disclosure – I was given the Rug Doctor Deep Carpet Cleaner and cleaning products free of charge for the purpose of the review and also paid for my time. All opinions are honest and my own. I am in full on nesting mode at the moment and am cleaning everything in sight! I really like having a clean home anyway, but being pregnant just gives me that little extra boost to go the extra mile. I was recently contacted by Rug Doctor to see if I wanted to try out one of their carpet cleaners and I was excited to agree, although I will confess that I didn’t think my carpets were that dirty given that they were new less than two years ago and we have a no shoes upstairs rule. Well, how wrong could I be?! We have three young children, two cats and a dog and I have noticed that especially in the autumn the carpets were getting dirtier than normal. The animals trample mud through the house and with the best will in the world the children invariably go upstairs in their shoes every once in a while. 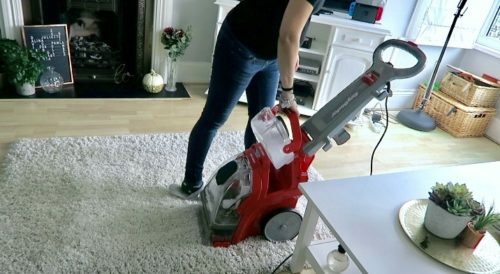 As our carpets are quite new I wanted them to stay in good condition so I have been vacuuming them regularly and I thought I would brighten them a little with a run over with the Rug Doctor – I had no idea just how much dirt my carpets were hiding though! 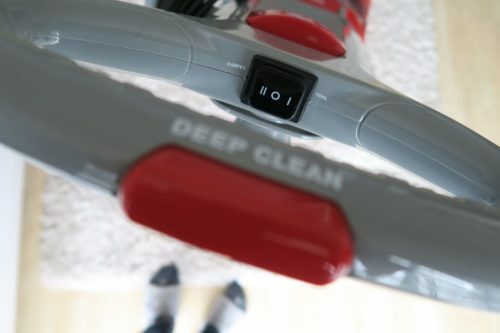 The Rug Doctor Deep Carpet Cleaner looks quite bulky so I was concerned at first that it was going to be difficult to use, I couldn’t have been more wrong. It was really easy to unpack from the box and we were ready to go with it within minutes. 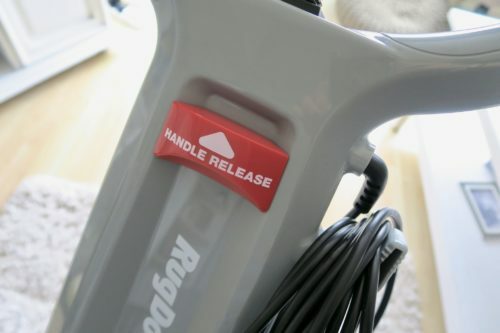 It’s very simple to use, simply pull it slowly backward over the area you want to be cleaned. There is a button on the handlebar to press if you want a deeper clean using the brushes and this is what I used. One switch operates the machine, flick it to one side to clean carpets and the other for using the tool. The handle is adjustable and also folds down for easier storage and there is a really generous amount of cable so you don’t need to worry about being close to a plug socket. 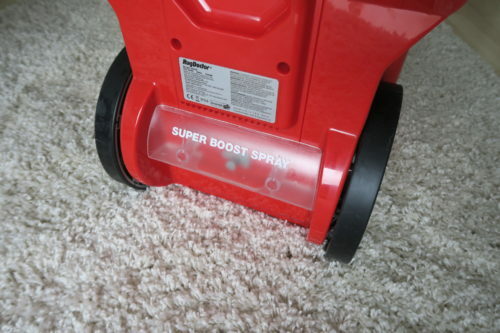 There is a super boost spray too, but I didn’t find cause to need it while I was using it. There is a clean water tank and a dirty water tank and they are easy to take out and empty/fill. The clean water tank comes with it’s own measuring cup as part of the lid which makes it really easy to measure out the cleaning solution and add it to the clean water. I filled up with warm water and the Rug Doctor Detergent and we were ready to go. The first area that I wanted to clean was the stairs as I knew that being a high traffic area these were going to be dirty. 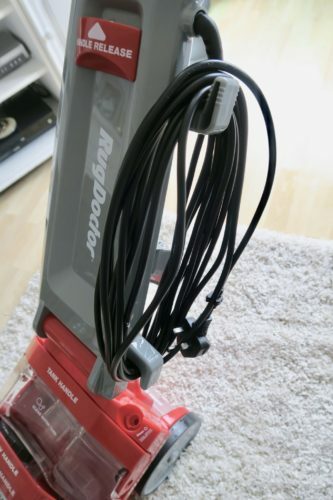 The Rug Doctor Deep Carpet Cleaner comes with a detachable hose which is perfect for using on the stairs. I started at the top and worked my way halfway down before moving the machine to the bottom and working up the other half. It was really quite easy to do and the attachment was really efficient and managed to get some stains out of the carpet with ease and left it bright and clean and smelling fresh. I then moved onto the landing which is an awkward shape (like most landings I guess). Despite its size the Rug Doctor was easy to manoeuvre on its back two wheels and I discovered that as it cleans right up to the edge there was no need to get out the hand tool to do the edges so this made it a really speedy clean. Moving onto our bedroom it managed to get some stains out of the carpet with ease. These were stains that our cats and puppy had left and I’d tried to clean by hand before unsuccessfully. The Rug Doctor made getting rid of these a real breeze. 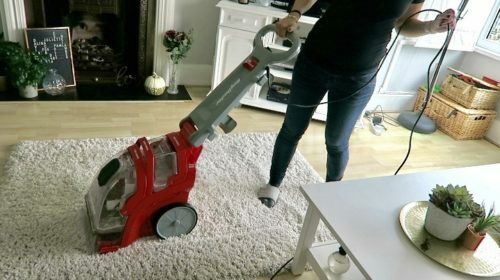 I had the cleaning bug by now, especially when I saw just how much dirt was coming out of the carpets; I couldn’t believe my eyes! I thought that as I regularly vacuum the house and we don’t generally wear shoes upstairs that the carpets would be cleaner than they were. I’m so glad that I cleaned them, I definitely won’t be leaving it so long next time! The rugs were next on my list to attack! Again, the Rug Doctor made quick work out of them and I’d say it took a maximum of five minutes to clean each rug. The same as the carpets, they were full of dirt that I had no idea was there! All the carpets and rugs were left slightly damp after I washed them, but I did the cleaning in the morning and they were dry by late afternoon, the stairs probably quicker than that. I did find that the rugs took the longest to dry. Finally I hit the sofa with the upholstery tool. I only recently washed all the covers on the sofa but of course one of the children had dropped something on there making a large stain. The hand tool was easy to use and got the stain out within minutes; I was really impressed, and it was so much easier than taking the covers off to wash which I would have done otherwise. 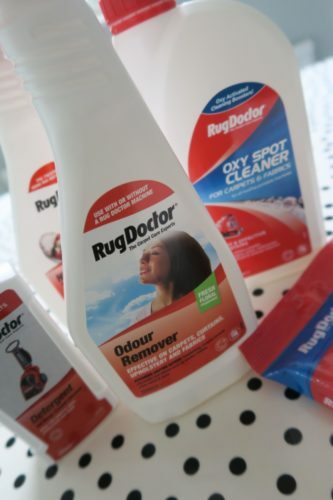 The Rug Doctor cleaning products were great to use and really effective. The Rug Detergent was easy to measure and put into the clean water tank and it was really effective at lifting dirt out of the carpets. 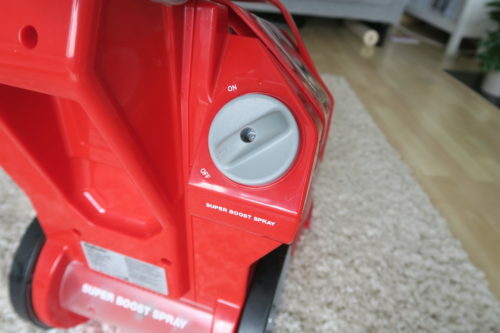 I also used the High Foot Traffic Cleaner to pre-treat the stairs and I know that the Odour Remover will be really useful for future pet or toddler accidents and the wipes will be so great for quick clean ups too. 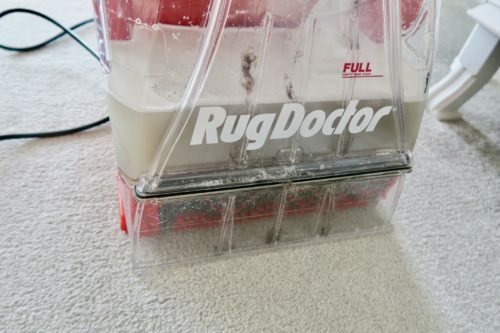 The Rug Doctor Deep Cleaner retails for £299.99. 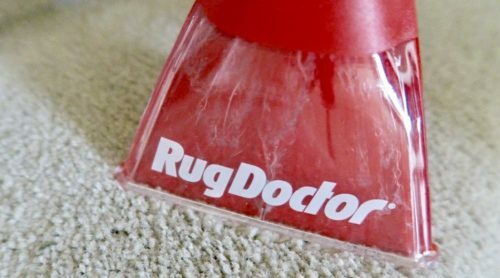 I was really impressed with the Rug Doctor and I know I’ll be using it often to combat the dirt and mess that our busy outdoorsy family makes! If you want to see the Rug Doctor in action, check out the video I made of me deep cleaning all the carpets on my YouTube channel. This entry was posted in Carpet Cleaning Tips, Carpet Cleaning. Bookmark the permalink.